Wooden bathtubs made of solid wood. We have wooden bathtubs in stock and produce also bathtubs made of wood according to your specifications. Their wooden bathtub can consist of many different types of wood. We place highest value on a wooden bathtub on quality and durability. The thickness of our wooden bathtubs is depending on the model between 5 and 8 cm. It does not matter whether rectangular, round, square or oval. At grinERA, you'll find it. If you have specific design concepts, you can contact us. Gladly we send you on the basis of sketches / or pictures a no-obligation free offer. 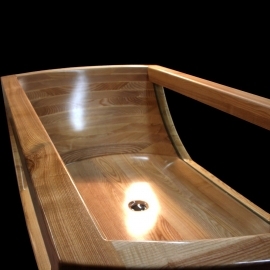 Wood bathtub There is 1 product.